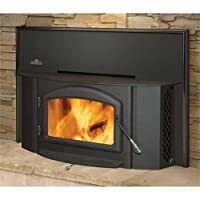 The 1402 wood burning fireplace insert's unique design allows for flush mount or hearth mount installation in either masonry or factory built fireplaces. Featuring standard" WHISPER QUIET" heat circulating blower & thermostatic sensor, this innovative design transforms small amounts of wood into large amounts of cozy heat. Customize your 1402 Insert with an optional cast iron surround kit, available in a variety of porcelain enamel or painted finishes that will enhance your decor. Venting Requirements: This unit requires venting pipe with an inner diameter of 6 Inches. Please see the venting components tab on this page for venting pipe that must be used with this unit. Features: BTU Output: up to 70,000 during Napoleon independent testing. Effective air wash in combination with high temperatures keeps the viewing glass clean. Insert finishes in painted black and porcelain black. Includes 2" WHISPER QUIET" heat circulating blowers. Economical 6" flue assures you of efficiency and cost saving installations. Secondary air tube insulated with ceramic fiber and protected with a stainless steel cover plate ensures complete combustion. Fully refractory lined firebox maintains the interior temperatures necessary to achieve low emissions and complete combustion. Cool room air is circulated around the firebox, heated and returned to the room. Non catalytic high tech design eliminates the need for a delicate ceramic catalytic combustor which can deteriorate over time. . The easy operation of a single lever burn control regulates primary and secondary air establishing a perfect mixture and providing a clean burn. 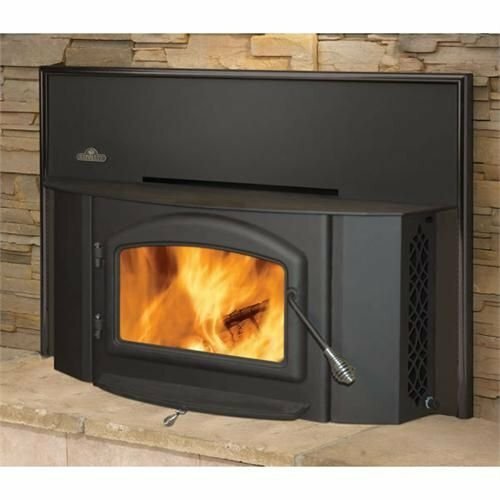 Complete with standard flashing/surround and trim to cover fireplace opening up to 32"H x 44"W. Note: Minimum opening for installation is 14" deep x 26" wide x 22" high with an approved lined chimney at least 15 ft. high. 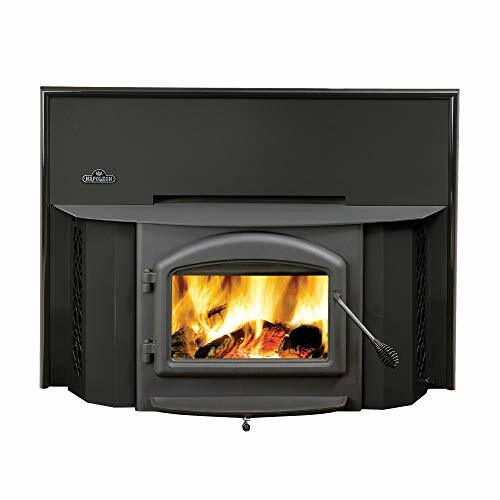 Only install into a solid fuel burning fireplace.